Peruvian Torch is usually green with a touch of teal. 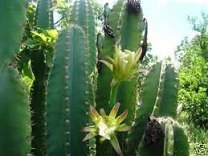 It is related to, and commonly confused with the San Pedro cactus. It grows a tall and slender single shoot as opposed to stems that branch off. Some may see this as a good aesthetic quality for a cactus. It typically grows straight, but sometimes the stem may become ‘twisted’ later on. This may also be considered a desirable ornamental quality. The cactus grows fairly fast. A Peruvian Torch can grow abnormally narrow because of inadequate exposure to sunlight. Peruvian Torch typically has longer needles than the San Pedro cactus. The needles are in clusters and grow at the edge of the ribs. There is usually one needle in the cluster that is noticeably longer than the others. This is unlike a San Pedro which has evenly sized and spaced needles. There are many variations of Peruvian Torch because of the hybrids that exist between it and San Pedro. Some variations have short needles resembling closer to a San Pedro. Many variations also exist because of the different climates of the Andes, where it grows wild. There are usually 5-8 ribs that protrude out. This gives Peruvian Torch a star shape when it’s sliced up horizontally. Peruvian Torch can be grown from seeds or cut from a pre-existing one. When cutting, care should be taken, because too much light or too little light can lead to bad results. The flowers are white and have lots of small stamen. It blossoms at the top but does not grow upward, instead it arches off to the side. Reddish petals are at the bottom of the flower’s crown. You can find the Peruvian Torch cactus in gardens, or as a potted plant indoors for ornamental purposes. Some owners are attracted by the aesthetic qualities of having a Peruvian Torch. Because flower blossoms are rare, many owners cherish it when it happens. Although Peruvian Torch is commonly used for ornamental and garden decoration purposes, not everyone wants to just stare at it. Some people consume it. Peruvian Torch, along with other (but not all) members of the Echinopsis family have psychoactive properties because of the mescaline content. Some methods must be implemented before it can be used as a drug. There are easy and complex processes to prepare it for psychoactive use, an easy one is to slice it up, then boil it in water for up to 8 hours. However, this process only gets a small amount mescaline. Peruvian Torch powder is also used as a psychoactive drug. Because of the horrible taste, many put Peruvian Torch powder in a sugary drink like juice or soda. Effects can take a few hours to experience, trips may be hallucinogenic. Because it is so often confused with San Pedro cactus (which is psychoactive too) it becomes difficult for users to find out which specie has better “dosage” then the other. Peruvian Torch contains mescaline. It is illegal in the U.S. to possess mescaline. However, it may be legal to have Peruvian Torch for ornamental purposes. That means Peruvian Torch powder is illegal, so is the sliced up form of it. It is legal if you keep it in your garden, or indoors for decoration. Peruvian Torch Powder was used by the Chavins of Peru for ritual purposes. They believed it could aid contact with the spirit world. They also used Peruvian Torch in the sliced form.